A Jewish lady named Mrs.
Rosenberg who many years ago was stranded late one night at a fashionable resort - one that did not admit Jews. The desk clerk looked down at his book and said, "Sorry, no room. The hotel is full." The Jewish lady said, "But your sign says that you have vacancies." The desk clerk stammered and then said curtly, "You know that we do not admit Jews. Now if you will try the other side of town..." Mrs.
Rosenberg stiffened noticeable and said, "I'll have you know I converted to your religion." The desk clerk said, "Oh, yeah, let me give you a little test. How was Jesus born?" 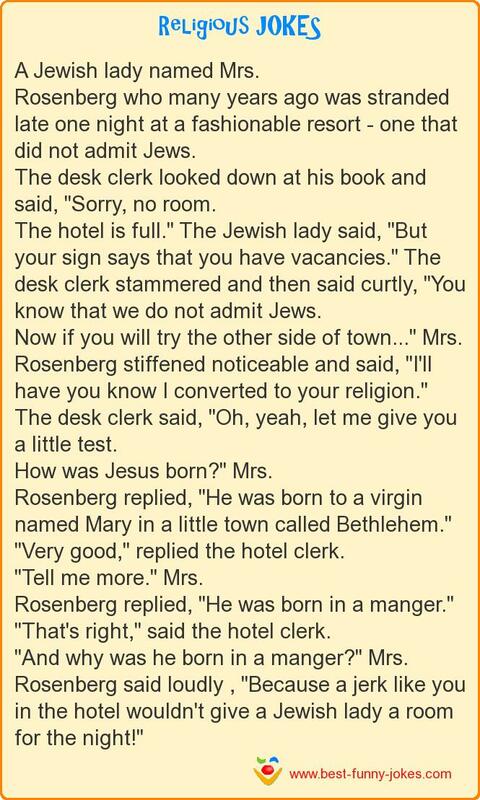 Mrs.
Rosenberg replied, "He was born to a virgin named Mary in a little town called Bethlehem." "Very good," replied the hotel clerk. Rosenberg replied, "He was born in a manger." "That's right," said the hotel clerk. "And why was he born in a manger?" Mrs.
Rosenberg said loudly , "Because a jerk like you in the hotel wouldn't give a Jewish lady a room for the night!"